What is Blonde & White and Never Been to a Restaurant? Everyone, Please Welcome, Kiwa Hirsuta. Somewhere Near Easter Island. What if you discovered a new creature. What if it was something truly amazing, almost alien - not just some slight variation of the sparrow. Would you study everything you could about it? Would you share it with the world? Dedicate your life to it? Celebrate it? Name it? Now, what if you discovered this new creature and were also a chef. Would you put it on a menu, cook it, and finally serve it? Maybe you’re a curious epicure? Would you eventually devour your discovery simply to know what it tastes like? As humans, how long do we wait until we pounce on our new neighbor? A year? When does the honeymoon end? How about three years? Tell me when does fascination end and famish begin? Perhaps it’s not even a time frame but a feeling. Maybe we eat it when we’re bored of it. Kiwa hirsuta is the newly found being in question. It is a member of the aquatic class Crustacea of the phylum Arthropoda. Kiwa hirsuta is what you get if Edgar Winter returned to Earth in his next life as a lobster. It is beautiful, strange and white as bone. Kiwa hirsuta is "so distinct from other species that they created a new family and genus for it." 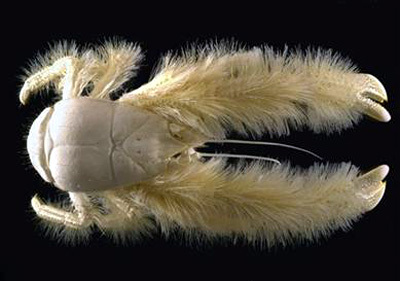 This lobster-like creature drapes its appendages in luxurious, silken, blonde fur. It is blind and appears to be albino. Although its lack of pigmentation may have to do more with the fact that it was found “in waters 7,540 feet (2,300 meters) deep at a site 900 miles (1,440 kilometers) south of Easter Island” rather than albinism. And from the reports I read it’s just a hair under six inches long – “about the size of a salad plate.” Hmm, salad plate, interesting choice of words. So, you see, I’m not the only one with visions of lobster salad tossing in my head. Woe unto you, Kiwa, if your flesh is as succulent as your distant cousin the lobster. But, alas, even if you taste like nothing at all, you are still in danger, because in the era of exotica, novelty itself is a highly coveted flavor. The top of the food chain has finally found you, Kiwa. You’ve managed to somehow, someway evade us, to make yourself nonexistent all of these eons, to swim under the sonar as it were. (When you’re low on the food chain, that’s a great talent.) Not bad for a crustacean who can’t even see. All this may be academic by now anyway. By Neptune’s will, the first crate of Kiwa hirsuta is, via gray market suppliers, frantically being dashed to the U.K. where Heston Blumenthal of Fat Duck will transmute this new addition on Noah’s Ark into an outrageous albino lobster stuffed mochi. Or, because the journal of the National Museum of Natural History in Paris broke the news, I can already sniff out an Alain Ducasse “blonde lobster soufflé” at Plaza Athénée. Robert Vrijenhoek of the Monterey Bay Aquarium Research Institute in California was the mastermind behind the dive which led to this discovery. Could Thomas Keller be in a Bugatti scorching up the way to Monterey for first dibs at this sea oddity and thusly establishing himself as the pioneer, the first man on the Kiwa hirsuta moon, all served up in a waffle cone? But chances are our new friend has already been plated as an exquisite sashimi appetizer, and is being passed around and wolfed down by Shanghai’s new and young capitalists, as they eat, drink and debauch in a gleaming Pu Dong penthouse, essentially, on top of the world. Was that hairy crab, they ask? Or was that the new thing? That new, white, blonde thing. Whatever. Been there, ate that. Next. The salmon paste is out of the tube. There’s no stuffing it back. Look for the disposable bibs with Kiwa hirsuta cartoon mascots at your local White Lobster chain. I hear the bisque is drinkable. Someone had to eat the first oyster. Who’s going to taste this virgin? Not really a virgin but who is nowadays? Kiwa hirsuta certainly has been eaten before by its natural predators, but they can’t possibly scribe Bruni-esque bon mots to illustrate the carnal wonders of albino lobster. That’s where one of us steps in. So welcome, little furry albino friend. Welcome to the rest of the world. Here, eat some of this. Fatten up. Don’t exert yourself too much. Get into this broiler. You’re only here to be served to man. Will there be a day when we won’t remember the day Kiwa hirsuta was discovered? I say yes. There will be a time when you’ll be able to find Kiwa hirsuta in a tank at the local seafood shack looking as sad as the Dungeness crab does today. But let’s hope for Kiwa’s sake, it won’t have a “Mc” in its name as a prefix in the future. I also hope in the future I won’t be sermonizing to the kiddies that I remember a time when you just couldn’t find Kiwa patties, fried Kiwa strips and Kiwa tacos on every block. In fact, I remember a time when there wasn’t Kiwa hirsuta at all. I do. I am not sure if I should admit that when I first heard this story on NPR a day or two ago, the first thought that crossed my mind was "Ummm, I wonder what it tastes like?!" i suspected that you have a wild, culinary side. if i ever get my paws on one of these fuzzy lobsters, i'll be sure to invite you to the boil. bring the butter and lemon. FANTASTIC post as usual, Eddie, I cracked up at the parallel with the jazz singer! I always loved your wild imagination! i don't know how large this tasty beast can get. i hope it grow very big. "kiwa" is the polynesian goddess of crustaceans. if you're going to name a future daughter "kiwa", you may as well start calling her "lobster queen" because that's what all her school chums will call her. kids can be so cruel. i've never seen "the jazz singer" but i know the plot. i don't see the parallel. please explain. grazie. Aww...I want one for a pet. I wonder if you can train lobsters to do tricks. And if it's a bad little lobster, I'll consider the sashimi option. what would you name your lil' pet/lunch? Clo meant Edgar Winter, you silly lobster brain! Even I got iot! I will call it Fifi the Fabulous! you sound like a scientist. but i do agree, it looks somewhat like a micro or even nano creature that habitates within a drop of sea sludge. everyone says this thing is cute. i personally think it looks good... ENOUGH TO EAT!!! Everytime I see this picture I think, "It's a tick all dressed up for a very festive formal affair!" One of the cuter bugs. i agree. alas, bugs just don't dress up any more when they go out for a nice evening.